Artscape Wychwood Barns is a community hub that includes arts and cultural activities, a food production and education centre, and environmental initiatives. It also houses live-work spaces for artists, several studios, an art gallery, offices for non-profit organizations, indoor and outdoor growing areas and an 8,000-square-foot covered ‘street’ used for farmers’ and art markets, conferences and events. A natural skating rink in the winter, a playground, a sand volleyball court and a community oven complement the landscape. Since opening in 2008, Wychwood Barns has become a dynamic gathering place for the neighbourhood and for the City of Toronto. All this in a former streetcar repair facility. Bringing this complex project to fruition was a long, challenging and often frustrating labour of love. It involved community activists, politicians, bureaucrats, friends and foes. Ultimately, it became an astonishing example of what residents can achieve and how they can express power in their own community. Elizabeth Cinello was a member of Friends of a New Park, a group dedicated to saving the Barns and imagining a new kind of park. She served on Artscape’s Community Advisory Committee together with Peter MacKendrick. Peter, a leader in the residents’ efforts to create the new Barns, passed away in 2012 and was recently honored by the Wychwood Barns Community Association. Here, Elizabeth tells the story of her group’s and Peter’s involvement in the eight-year long effort to realize their dream of saving the barns and creating a unique community park. 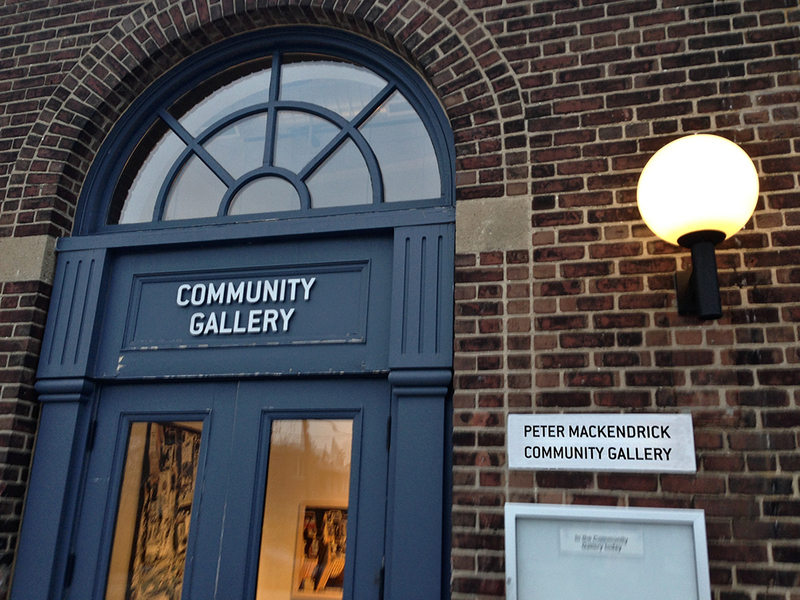 On January 23, 2014, the Wychwood Barns Community Association (WBCA) renamed the community gallery in honour of Peter MacKendrick (1955 – 2012). “The first word that comes to mind when I think of Peter is gentleman,” offers Roscoe Handford, manager of The Stop’s popular Saturday morning farmers’ market at the Artscape Wychwood Barns. We’re in the atrium at Sick Kids Hospital where Roscoe’s farmers bring local food to the food court. She’s wearing a jacket with her pet Holstein black and white pattern. We sit down to talk about Peter MacKendrick and the early days of the fight for the Artscape Wychwood Barns. It’s how we met Peter and each other – organizing to save the barns. Peter and I served on Artscape’s Community Advisory Committee. Roscoe, her partner Kevin Frank, and other members of Friends of a New Park, worked closely with Peter through the eight-year development ordeal. Early in the 1990s, the potential of the TTC ‘barns’, which had been a streetcar repair facility, was obvious to local artists but at meetings with city councillors, the message was always the same – there was nothing to be done. Instead, the city proposed housing projects for the site. Alternatively, it would sell the land to a developer and negotiate for a corner green space. In every case, the barns were not part of the picture. Roscoe and I chuckle about the ugly fight that ensued. It’s like the ugly duckling story – the early hardships make the beautiful swan even more beautiful. First, we had to convince the city not to sell off the streetcar barn site, a 4.3 acre brownfield with contaminated soil. After that, there was the battle to save the barns. The five barns had been used to repair and store streetcars until 1998 and took up 28% of the site. In 2001, heritage architect Philip Goldsmith recognized the complex as a significant example of early twentieth century industrial architecture. Now all we had to do was find millions of dollars to renovate 53,000 square feet of built heritage. Artscape, a Toronto non-profit urban development organization, conducted a feasibility study in 2002 that concluded that any one option of a two, three or four barn development, with a greenhouse and an additional frame-only barn structure, would be viable for the site. We were excited that Artscape, The Stop, and Councillor Joe Mihevc were engaged with the community to find a solution. We dreamed of a new kind of park that would integrate all the buildings, but the more barns we saved, the more it would cost to save them. It felt like a game of Russian roulette and the barns were the losers. It was unsettling. Then, unexpectedly, we found ourselves up against a small group of neighbours with differing agendas about the site, from selling it off, to building a sports centre in one barn, to having a park of grass and trees. They came together in their single-minded opposition to our idea of a new kind of park. They tapped into concerns about parking and noise to advance the option of a park without the barns, without artists, and without a greenhouse. Some anti-barns tactics were over the top – like the pound of lard a woman sent to every city councillor before a key vote to save the barns and turn them into a multi-use centre. A note attached to the bag of lard said that neighbourhood kids would get fat if the barns site were used for anything but a sports centre. “You can’t make this stuff up,” Roscoe and I laugh. By then we had managed to get a heritage designation for the 1913 barn, which meant that it could not be torn down. If it had to stay, the anti-barns group insisted, it should be a storage facility for Parks and Recreation. They did not like the idea of artists in the barns. To them artists were ‘drug addicts’. The Stop’s proposed greenhouse was a ‘soup kitchen’ and together with artists, they claimed, it would bring the neighbourhood down. The political undertones were obvious and bully tactics were used in attempts to intimidate us. In discussing how the community came together to save the barns, Friends member Schuster Gindin explains, “Peter’s collaborative spirit and decency stood out. He exemplified community activism at its best.” Because of that spirit the story ended as well as it did. We weren’t motivated by anger or self-interest, or personal preference. We wanted to work with people not against people. We wanted to bring people together, not keep people out. It could have gone the other way. The anti-barns group badgered us with insults and innuendo, publically and anonymously. We didn’t always agree amongst each other either. It would have been easy to walk away. We stayed with it because we believed in a public process and we participated in it constructively. We did the obvious things – we deputed, wrote letters, went to meetings, organized meetings, and knocked on doors. In the absence of an effective city policy that protects buildings, even publicly-owned buildings, we felt it was our civic duty. We had fun, too. We organized photography exhibits, arranged historical talks, wrote articles, and created a web site. We found people who had worked at the TTC barns and wrote up their stories; we built an outdoor oven with the barns’ paving bricks and baked pizza in it, and Peter made a natural ice rink. We created a homemade park to demonstrate what it would be like to have one there. We got together over dinner and talked about art, culture and politics. We became good friends. I smile every time I see that smokestack with the band of coloured rings. A photograph, a bake oven, a skating rink, can each be a very powerful thing. Back in 1998, the pubescent, newly-amalgamated city of Toronto was looking for ways to deliver a zero tax increase while trying to meet ambitious harmonization goals. The city was ready to sell assets. When Peter and other residents on Slade Avenue (a street perpendicular to the barns) saw developers taking pictures of the site, they jumped into action. 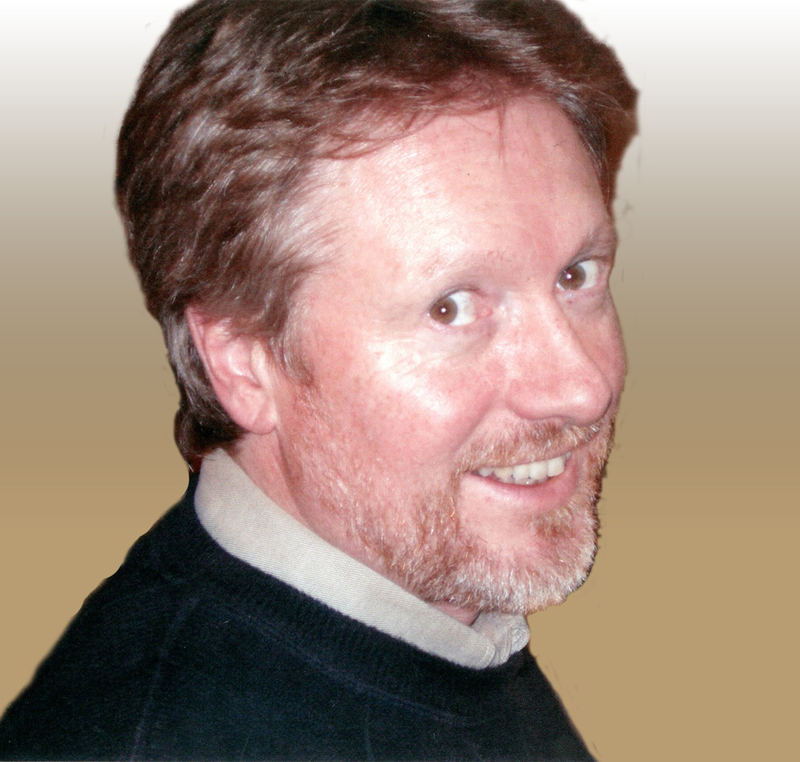 Soon after, in 1999, Peter co-founded the not-for-profit Taddlewood Heritage Association together with members of local residents’ groups. Taddlewood was dedicated to preserving the threatened barns site as 100% park. Its not-for-profit status was important and as an incorporated affiliate of the Ontario Historical Society, it had credibility. With a formal structure, a mission statement, constitution, and by-laws, it had accountability. Taddlewood could issue tax receipts for donations and apply for grants. Right away, Taddlewood went to work raising awareness and money to save the barns site and make a park. Friends of a New Park – neighbourhood artists, environmentalists, and academics; lovers of built heritage, labour history, and all things TTC – came together as an ad hoc advocacy group in 2000. Friends’ loose structure allowed us to work quickly and creatively. We didn’t have to agree on everything or put things to a vote. We each did what we were good at, and we helped each other do it, just as friends should. 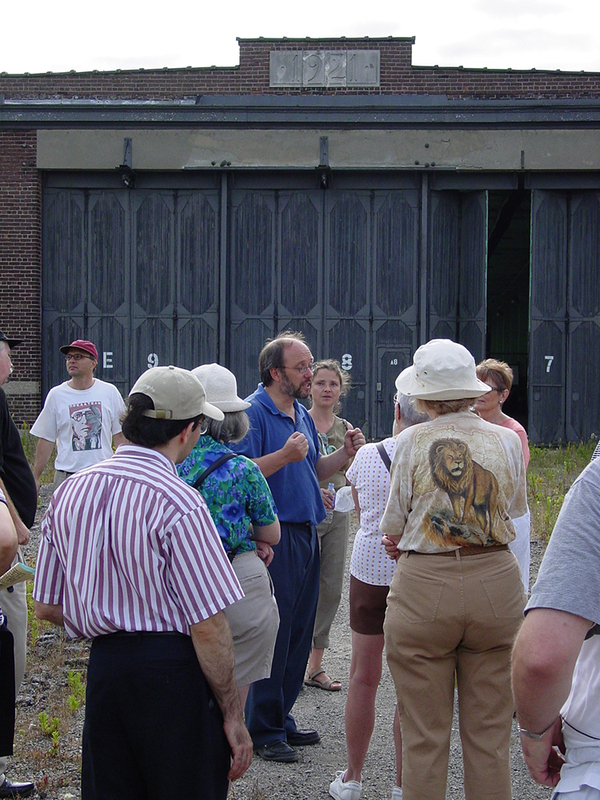 In 2000, newly-elected Ward 21 councillor Joe Mihevc convinced city council to undertake a heritage study of the barn buildings which resulted in the Philip Goldsmith report. Mihevc was a game changer. Finally, the barns site had a friend at city hall, a skilful, smart friend who could shepherd the project through the chaotic times of amalgamation fallout. Early on, Mihevc saw the beauty and potential of the barns and he worked closely with Friends and Taddlewood. Peter MacKendrick’s contributions to creating the park were many but one of the most enduring was the natural ice rink that brought the barn site to life in the winter months. Peter was a photographer and a hockey player. When he saw the 1914 photograph Skaters on Poverty Pond, taken at the barns site, he knew what to do. His inspiration earned him the handle Lord of the Rink. I learned of this ‘crazy man’ making a rink on the barns property from my partner Roscoe. I grew up with a rink in my yard so I immediately threw on my coat and headed down there. It was Peter. I had met him a few times before at community meetings. Peter had run a hose from his yard three houses away from the park. It wasn’t much of a park back then. We had to work around abandoned hydrants and rails. Eventually, Peter discovered the city’s Natural Rink Volunteer Program, which supplied bigger hoses and a hook-up to the fire hydrant on Slade Ave. We were both early risers so scheduling a 6 a.m. session of shovelling and flooding was easy. I never once arrived before him. Even if I set my alarm earlier, when I got there Peter was standing quietly surveying the job ahead. Word spread and more neighbours helped out: Dugald, Dan, Neil, Chris – the list is a living document of good people doing good things. With money from Taddlewood we purchased floodlights and installed them on the old wooden fence. Peter hooked them up to his house. Voilà: a rink. We were in business. Day-long shinny games erupted on weekends. Three generations laced up their skates, chose sides and carried out a Canadian tradition of outdoor hockey. Peter soon had his own photographs of today’s ‘skaters’ and testimonials about how the rink brought people together. He listened to quiet confessions of adults coming out late at night, away from judging eyes, to finally learn to skate. The rink’s place in the neighbourhood’s culture was secure. Peter poured more than water onto the rink. He poured his heart and soul. He showed us that leadership doesn’t have to be loud or flashy. I stood beside him on countless pre-dawn mornings watching water freeze. It led me to understand the importance of community space and how we all share in the responsibility of caring for and about it. Peter did that. We called him “The Lord of the Rink”. He was much more. Peter’s natural ice rink was the beginning of a friendly neighbourhood takeover of the barns site by Friends and Taddlewood. Fundraising events and city Environment Days livened up the brownfield in the spring, summer, and fall. We opened the big sliding doors and gave tours of the buildings. Before long, artists, photographers, filmmakers, historians, gardeners, cooks, hockey players and skaters were shaping the future of the barns. People were getting interested. Eventually, we zeroed in on a community vision for a multi-use site. The barns weren’t going with a whimper. At Dufferin Grove we’d been looking at the bake oven. Jutta asked us to wait there and rode away on her bike, returning within minutes with a very heavy door under her arm. She said it had been the door for the first Riverdale oven but that oven didn’t draw well because ‘the arch wasn’t right and they blamed the door.’ Jutta kept the door because she felt it was a perfectly good door. She was right, of course. Even after the opening of the Barns in 2008, Peter was inventing and improving. He figured out how to add more exhibition wall space to the gallery – not an easy thing to do in that small space with big beautiful windows that had just been freed from the grip of plywood. His wife, Debra Slack, his family, friends, neighbours, and colleagues came out to celebrate the gallery’s renaming. Tim Jones, Artscape’s President and CEO, City Councillor Joe Mihevc, and photographer and member of Friends of a New Park Vid Ingelevics, remembered Peter’s passion for the barns site. An exhibit of Peter’s last photographs, Winter Gardens, was launched in the newly-named space. See more of his work on Peter’s website. Read about when the Barns were a workplace. The rink has been an annual project since 2001 with the exception of 2012 when there were mild temperatures and no snow. – TTC declares the Wychwood Barns site surplus and hands the property over to the city. – The city wants to demolish the barns and sell the land. – MacKendrick co-founds the Taddlewood Heritage Association. Under his leadership the organization joins other voices in the community and lobbies for 100% park designation. – Taddlewood does an analysis of city parkland statistics and confirms Ward 21 is the second most parkland-deficient ward and starts a petition for a 100% park. – MacKendrick designs and builds the natural ice rink and skating paths in the same location of Poverty Pond in the 1914 photograph. -In support of the 100% park option for the barns site, Taddlewood organizes the first Winterfest, an annual community celebration of the Rink. – City Council votes in favour of 100% park designation. -Taddlewood organizes the Giant Community Garage Sale and Corn Roast on the Wychwood Car Barns Site and raises $5,000.00 for Green Projects. – City puts up new hoarding at Slade Avenue to keep people out of the site. – MacKendrick cuts a small doorway into the hoarding so he can get to the rink site and run the water hose from his house. – City covers up the opening. – MacKendrick recuts the opening. – City salts the rink. Eyebrows are raised. – MacKendrick refloods the rink. – Taddlewood Heritage Association wins a Heritage Toronto Award for its efforts to preserve the Wychwood Car Barns and turn the surrounding area into a park. – Taddlewood and Councillor Joe Mihevc organize Sweet on the Park Valentine’s DayFundraiser, with Honorary Chairs Kurt Browning (Canadian World Champion figure skater) and Sonia Rodriguez (ballerina with National Ballet of Canada); $40,000 raised for park facilities, ensuring park use during redevelopment. – The movie, The Lord of the Rings: The Fellowship of the Ring hits movie theatres. – Someone calls the hole in the hoarding, ‘the hobbit hole’ and MacKendrick earns the handle Lord of the Rink. The film Score: A Hockey Musical features the Wychwood Barns Rink. Send Kevin Frank a note at: kevin.walter.frank@gmail.com. Thank you for a wonderful issue and articles. Loved this story. It reminded me of riding the St. Clair West streetcar as a kid, when the driver would announce the stop: “Wychwood – Home of the three churches”. Now when you arrive, the automated voice announces “Artscape Wychwood Barns”….What a testament to the power of these friends! Tags: Cookie Roscoe Handford, Friends of a New Park, Kevin Frank, Lord of the Rink, Peter MacKendrick, Skaters on Poverty Pond, Taddlewood Heritage Association, Wychwood Barns, Wychwood Barns Community Association. Bookmark the permalink.